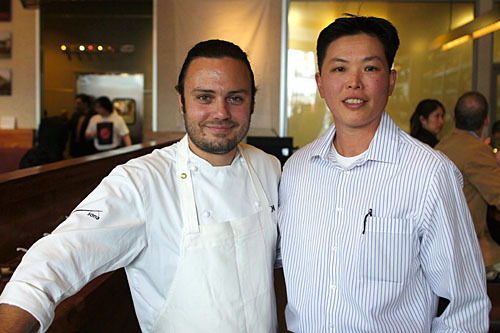 My last visit to Breadbar Century City was almost a year ago, for Hatchi, the restaurant's now-defunct pop-up series. 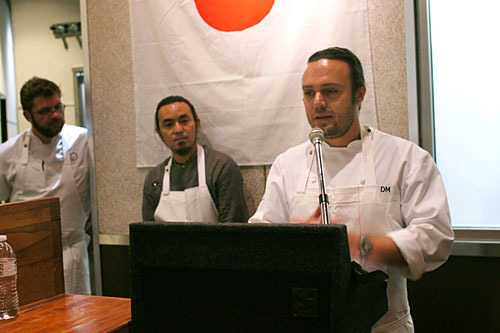 What brought me back was an even more compelling dinner, one featuring some of LA's most celebrated chefs, all cooking in support of disaster relief efforts for the quake-ravaged Japanese prefecture of Ibaraki. 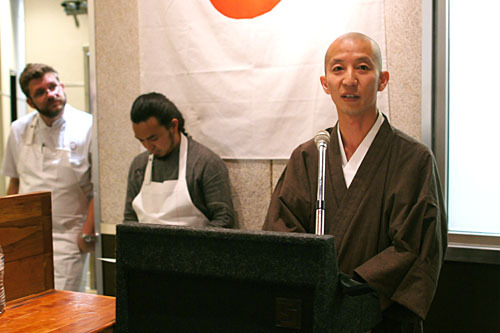 The event was hosted by Breadbar's resident "Chief Gastronomy Officer" (and Ibaraki-native) Noriyuki Sugie, and featured the likes of David Myers (Comme Ça, Sona), Michael Cimarusti (Providence, Water Grill), Walter Manzke (Church & State, Bastide), Hiroyuki Urasawa (Urasawa, Ginza Sushi-ko), and Ramon Perez (Sona). Sugie has partnered with the governing body of Ibaraki Prefecture and Kiuchi Brewery (makers of the famed Hitachino Nest beer) to set up a special relief fund, and all proceeds from the dinner will go toward the rebuilding of a destroyed school and construction of a shelter for children in Sugie's hometown of Hitachi. 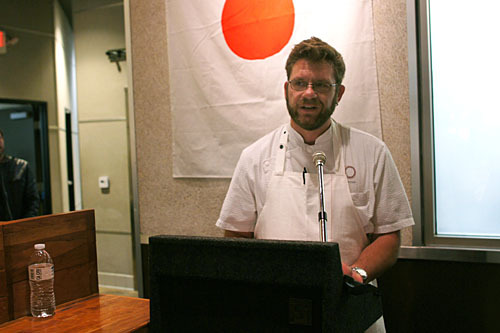 Tonight's dinner will be followed up with another on the 18th, hosted at Comme Ça by Sugie's compatriot Chef Myers (the two met at Charlie Trotter's), who also has ties to Japan. 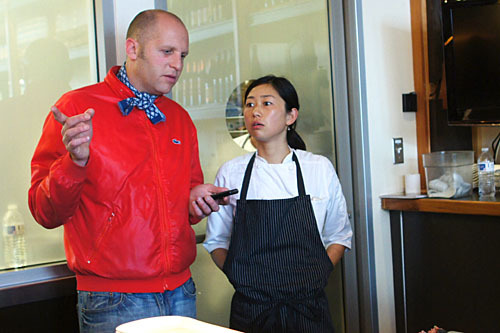 Since shuttering Sona almost exactly a year ago, he's opened a David Myers Café and two SOLA patisseries in Tokyo, in addition to debuting an additional outpost of Comme Ça at the new Cosmopolitan in Las Vegas. 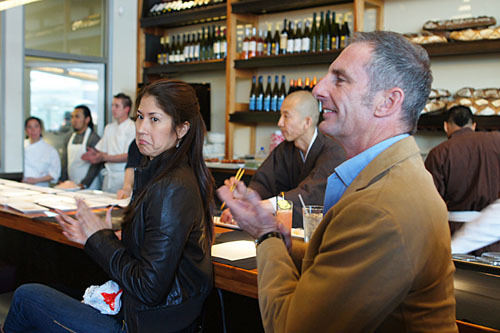 Wednesday's dinner will feature the talents of the "authenticity club," namely, Jon Shook (Son of a Gun, Animal), Jordan Kahn (Red Medicine, XIV), Michael Voltaggio (INK, The Dining Room), and Roy Choi (Chego, Kogi), in addition to Sugie and Myers himself. 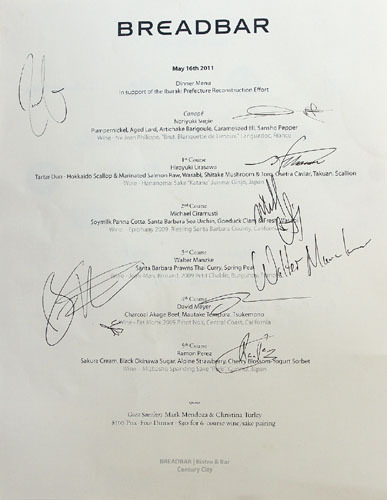 This evening's menu was a six-course prix fixe, priced at $110 per person, while wine pairings from Mark Mendoza (sommelier at Comme Ça) and Christina Turley (ex-Momofuku sommelier and eldest daughter of Turley Wine Cellars founder Larry Turley) were available for an additional $30. 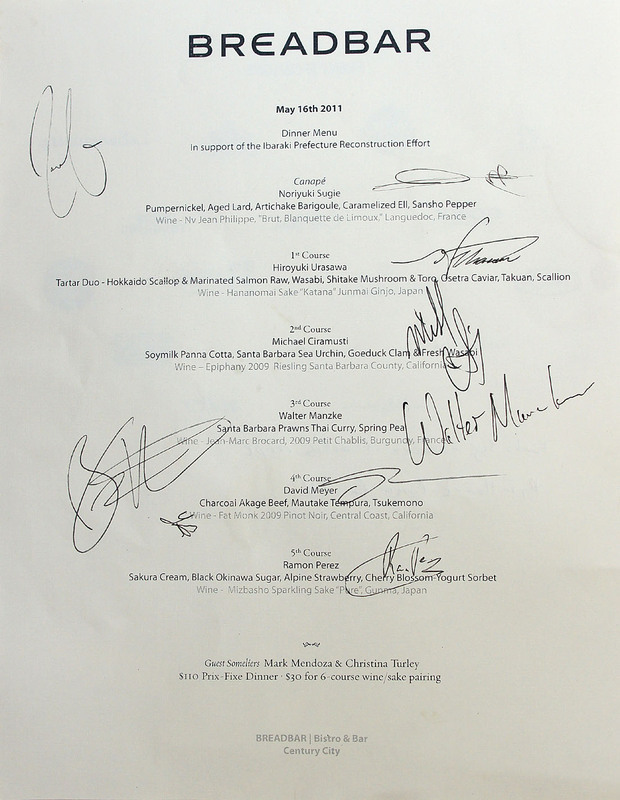 In addition to the named chefs, note the signatures of Jacob Kear (ex-Lukshon), Kuniko Yagi (Myers' former Chef de Cuisine at Sona), and Ryan Howard (a chef from Comme Ça Las Vegas). 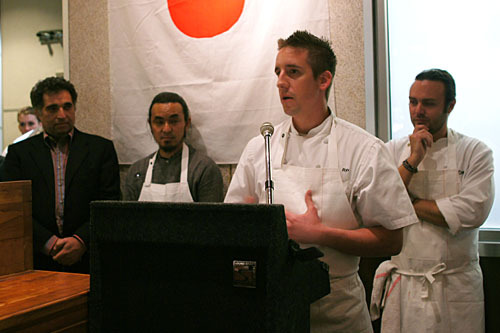 Also in the kitchen were Margarita Manzke and Jon Butler (assisting Chef Manzke), James from Providence, as well as Urasawa's assistant Ken-san. Click for a larger version. We began with a trio of hors d'œuvres from our host Chef Sugie. I went for the spoon of caramelized eel first, and really appreciated its sweetness, which recalled that of a traditional preparation of unagi. At the same time, the Sichuan pepper added a prick of pungency to the bite that helped balance things out. 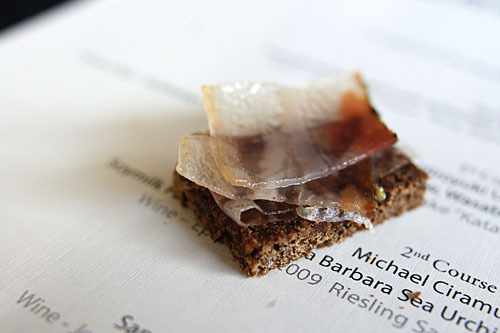 Next was the tab of pumpernickel, topped with shaved lard. 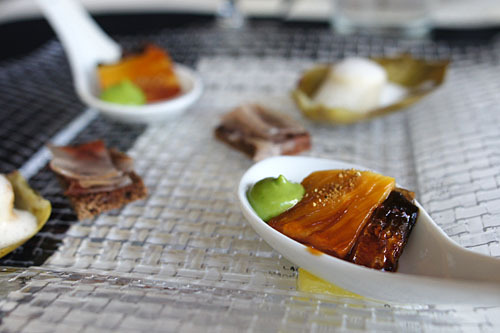 Here, I liked the bittersweet, almost astringent flavors at play, and how the lard added a palpable sense of weight and richness to the canapé. Last up was the barigoule, Sugie's take on the classic Provençal dish of braised artichokes. I'm not generally a huge fan of artichoke, but here I enjoyed the sheer tenderness of the vegetable, as well as the slight piquancy of its foam topping. 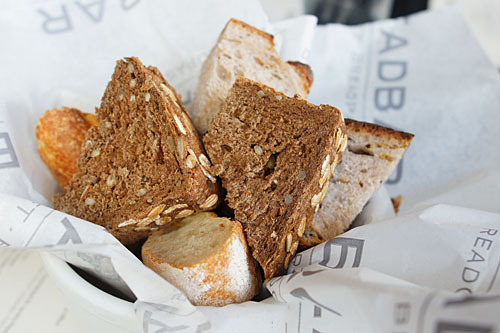 Given that we were at Breadbar, the bread was expectedly strong. 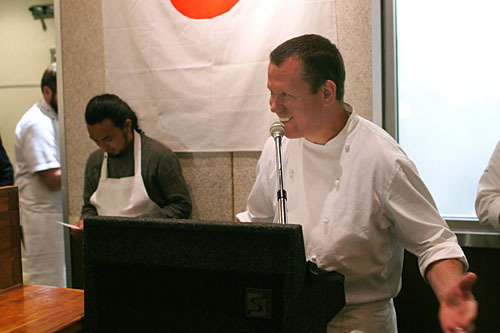 Urasawa stepped up with a twosome of tartar for our first proper course. 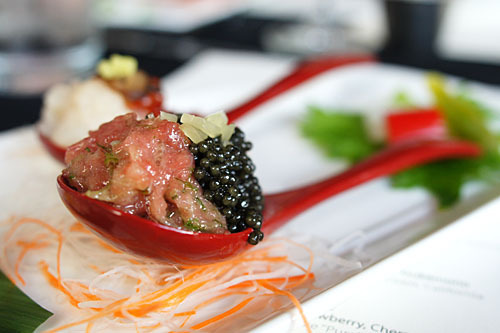 I started with the scallop, and found a nice interplay between the sweet, delicate hotate and the sharp brininess imparted by the ikura, all moderated by spicy overtones of wasabi. The toro, meanwhile, was even better. 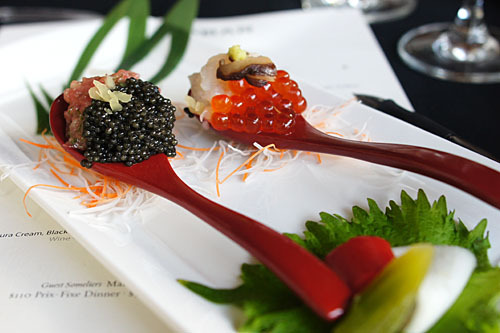 The lusciousness of the fish just worked marvelously with the salty smack of caviar, while the combo of scallion and takuan (pickled daikon) did a great job in tempering the bite. Cimarusti's "fishbowl" was certainly the most visually arresting piece of the night. 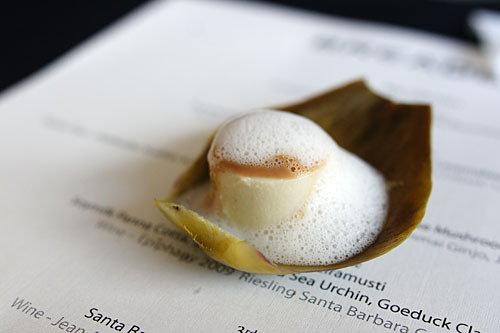 Here, the interaction between the panna cotta and uni was superb, with the two elements playing off each other perfectly, forming a luscious amalgam of sweet, creamy, ocean-y goodness. 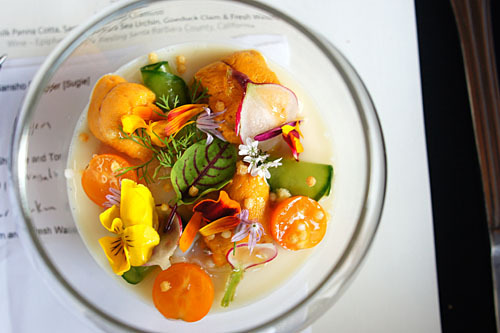 At the same time, the paper thin slices of geoduck further intensified the salinity in the course and added a nice bit of crunchiness as well, while the various veggies helped to moderate and ground the dish. 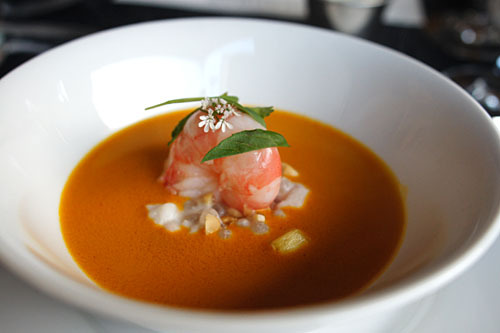 A healthy-sized Santa Barbara spot prawn arrived perfectly cooked, showing off a delightfully supple texture and crisp snappiness. 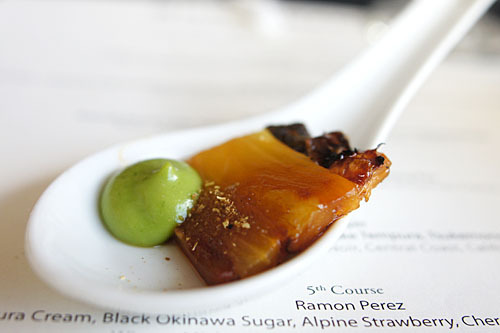 Its subtle, subdued sapor was deftly complemented by the contrasting flavors of the spicy, yet sweet curry and bright, green, vegetal pea purée. 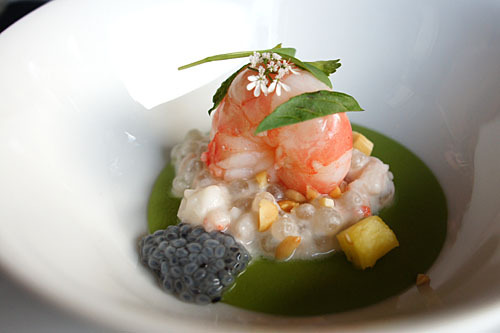 All the while though, the prawn still managed to be the hero of the dish. Our pièce de résistance, so to speak, brought us a rather disconcertingly blackened cut of akage-wagyu (red haired wagyu) beef. The meat had a bit of bite, along with a fantastic amount of "beefiness." Its taste was stupendous, and demonstrated a simply profound depth of bovine flavor, all accented by a tinge of bitterness from the char. I also appreciated the pairing of mushroom tempura, as well as the countervailing tartness of the various pickles presented. 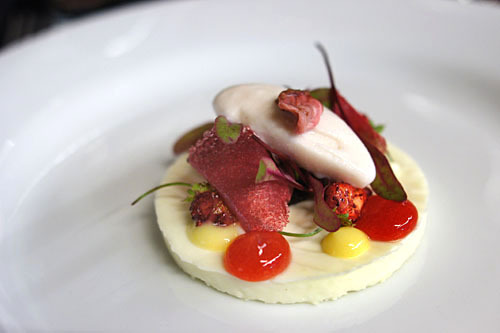 Finally, Perez wraps things up with a dessert showing off his typical artistry on the plate. Here, I enjoyed how the sakura (cherry blossom) cream formed strong base for the dish, a stage on which the other ingredients could really sing. There was an expert balance of sweet and tart flavors going on here, all heightened by a touch of savory flair. Very nice textural variation as well. 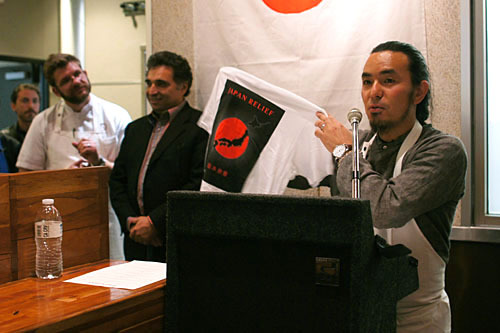 At the end of the meal, the chefs were each given a chance to speak (and pimp t-shirts--yes, we bought some!). 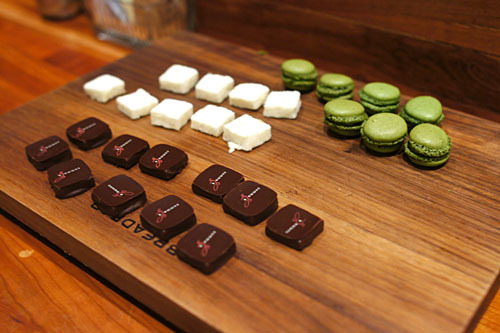 Some mignardises at the bar to close out the evening: chocolates, marshmallows, and green tea macarons. All in all, a wonderful evening, full of great food, great company, all for a great cause. 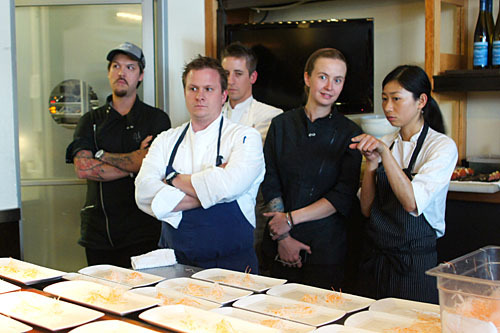 The chefs managed to exceed my expectations, putting together a menu that showed off their individual styles while still remaining cohesive. Given the strength of this meal, it'll be interesting to see what the "young guns" come up with on Wednesday! Good to see you tonight Kevin! Nice post. Good seeing you tonight Kevin! Loved your photo of the fishbowl. So pretty! What a fantastic fund raiser. 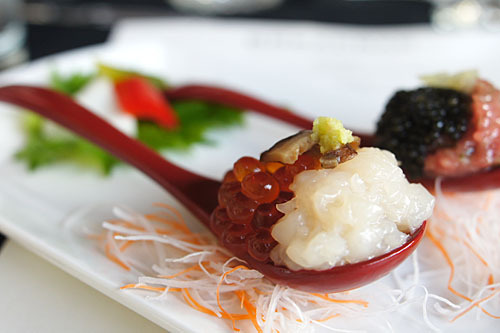 The scallops and ikura look especially delicious! 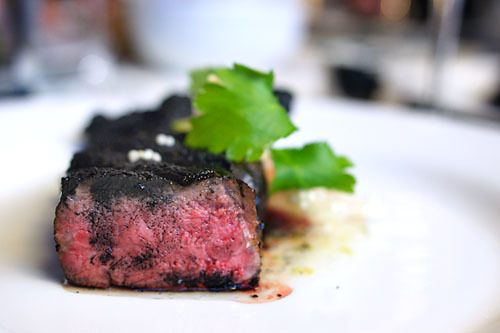 Thanks for another mouthwatering review - going to Vegas in June and have my reservation at e! Can't wait to check it out after reading your review!! Darin: How am I not surprised that you were there lol...See you Wednesday? Danny: Yeah it's definitely been a while. You going to the next one? Cathy: Indeed. We were actually all struck by the beauty in that dish. Tasted great too! Sarah: That's great that you got in to é. Tell 'em I sent you! Thanks for the pic Kevin! I saw it the morning after and was stunned. And as for the event itself, all great plates. I had to miss part II - went to e in Vegas that night. SUPERB. 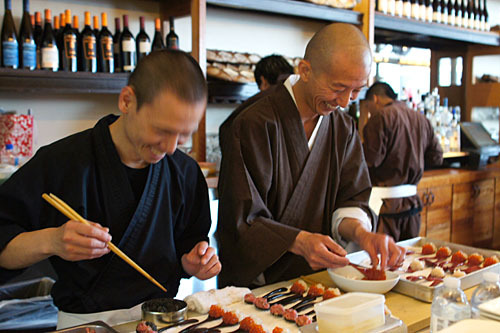 Good to hear that you enjoyed yourself at é. Has the menu changed since my visit? There were a few differences but for the most part it was the same. Crispy chicken skin w/chicken oysters & morels cooked in papillote were among noted differences, which were 2 of my top 3 favorites of the evening. 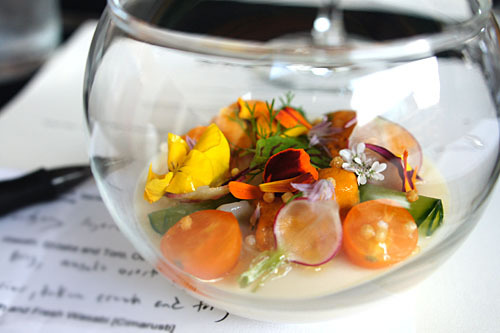 I'm heading down to Kitchen 1540 in July, anything I should make a point of tasting? 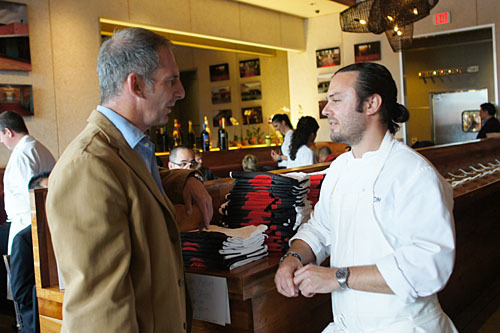 At 1540, I'd definitely arrange a special tasting menu beforehand and let Chef McCabe do his thing. Lost respect on the photoshopping of your prawn dishes???? ?